As the special Parliamentary committee on copyright reform works its way through the list of witnesses commenting on Bill C-32, we continue to hear a lot of determined advocacy from the free culture crowd about the educational fair dealing category. As I've noted elsewhere (here, here, here, here, here, here... aaand here) most of this lobbying comes from organized educational interests with an eye on budget savings. The savings, of course, will come at the expense of professional Canadian artists and other creators who currently enjoy straightforward protection of their work and a licensing structure that makes classroom use seamless and trouble free (for a reasonable price). 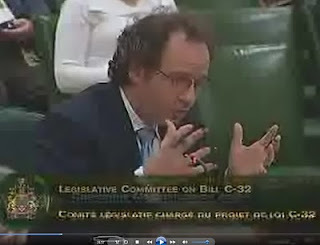 Anyone who doubts that creators will lose revenue with this change should listen to the testimony of free culture's self-appointed Canadian guru, Dr. Michael Geist who, when asked a straight yes or no question, was forced to admit to the Parliamentary committee that creators would foot the bill for education. You can see that testimony online at this link, (skip ahead to around the 24:30 mark to see Dr. Geist challenged on the point of lost revenues under educational fair dealing). He tries to equivocate, but ultimately can't. You will also see the other two witnesses, both professional IP lawyers (Giuseppina D'Agostino and Barry Sookman), making unequivocal statements about creators losing revenue. Interestingly, since that testimony, Dr. Geist has been all about "compromise" in copyright reform and especially on the topic of educational fair dealing. Of course, a Geistian compromise on educational fair dealing STILL involves broad new freedoms for those very organized educational interests, and STILL involves considerable lost revenues for creators. Don't try to find those admissions in the good doctor's latest compromise posting. It seems when he's not facing a panel of demanding public officials, Geist keeps his cards close to his chest. Tell you what, we'll ignore all your objections and just go ahead with the deal as I originally described it. Frankly, I've been offered better compromises on a used car lot. What gets ignored in much of this educational sector lobbying are the real world uses of created content, real world uses that could all quite easily be covered by an affordable licence. Over the holidays I ran into a friend who teaches at a local university. He is the author of a number of excellent textbooks on subjects related to democracy and social justice. We began to talk about Bill C-32, specifically about the extension of “fair dealing” to “education” – likely to provide a huge “educational” exemption from copyright. I felt depressed that so many educational institutions support this flawed legislation. It’s a Bill that, among its many flaws, will very likely destroy the copyright collectives which administer the right to use our work in schools. Our conversation led my friend to tell me a story about his reality as a teacher. Early in the fall semester he asked one of his classes how many of his students had purchased the course textbook. Only three of the 150 students in the class put up their hands. So he asked another question, “How many students have access to the text from other sources?” Most of the students raised their hands. Someone had been good-hearted enough to scan the entire book and put it up online. I asked him what he did. He shrugged and told me he asked them if they were paying to download the files. They said, “No, the download was free.” No one was profiting from the theft but nevertheless a serious theft had occurred. He felt powerless to do much about it. Three textbooks were sold, 147 stolen and a professor who writes textbooks on civic responsibility feels powerless to do anything about it, quite depressing. I hear stories like this all the time. In fact, I am married to a university professor who shares my horror at the real world copyright infringement she witnesses as a matter of course in her job. The free culture crowd does not speak for that civics professor, and neither does it speak for my wife and the vast majority of her colleagues with whom she's discussed this issue. REAL educators want the creators of their educational materials fairly treated under the law and by their educational institutions. Is it all about the money? Well, no, it's about the fact that the cold comfort on copyright reform, and the bafflegab about fair dealing is actually coming from the places we normally trust to seek truth and model ethical behaviour. The slick used car compromise to Canadian creators is being offered in the guise of scholarship. Why is it so important for churches and church leaders to adhere to the Canadian Copyright Law? Aside from protecting the rights of the artist, it becomes an issue of hypocrisy. If we wish to speak ethically about the world then we simply must comply with the laws and not circumvent them when it becomes burdensome. ...The longer that the church compromises copyright law the more damage is done to our reputation. We begin to lose our credibility to speak ethically to a society, about how we ought to be as a people, a culture and civilization. "How many students have access to the text from other sources?” Most of the students raised their hands. Someone had been good-hearted enough to scan the entire book and put it up online. I asked him what he did. He shrugged and told me he asked them if they were paying to download the files. They said, “No, the download was free.” No one was profiting from the theft but nevertheless a serious theft had occurred. He felt powerless to do much about it." The ease of digitizing content and sharing it is an issue, but what does any of what students do on their own with their own computers have to do with the educational exception for "fair" dealing? The teacher wasn't putting the scanned textbook in Blackboard and saying "have at it!" Of course I'm not sure who you are Anonymous, but I think you missed the salient facts of the example. That's because there aren't any Sandy. Or are you and John saying that students digitizing and sharing textbooks would somehow be covered by the proposed education exception? In which case I will reiterate my own favourite hyperbole from your crew, "I say to you the VCR is to the movie producer and...."
In the real world John most everyone, unfortunately, has self interest at heart. The Education institutes wanting to make costs as low as possible, the writer who wants to maximize his return for his work, the student who is trying to make their few bucks go as far as possible. How C-32 impacts these three groups is the question at play here. Your examples of students copying textbooks, while deplorable, have nothing to do with the proposals in C-32. So what will C-32 change? That is the discussion that needs to take place. From a philosophical point of view I would hope that the education fair use provisions would be about unencumbering creative uses of material in new and innovate ways in the classroom, not a way to get out of paying writers for their work. I know this is not the way it is perceived or playing out in the many peoples minds. As you know John, I am in support of creators and their need for work to be compensated. I am not, as you like to call it, a free culture advocate. Yet I am also a realist who sees the capabilities and attitudes of the emergent generation. There needs to be an effort to engage rather than alienate them in regards to the value of inputting into culture and society rather than just taking it. Big content, as you referred to it, is doing a dismal job in this regard. They are on a short sighted war footing, and as anyone can tell you that just creates two camps .. us and them. These tactics need to change, build bridges instead. Yet still amongst this there is INCREASING sales of much media content, just now in different and not always as profitable formats. Yet we do live in a market economy and thus business cannot dictate what the consumer wants to buy. So many people are buying media, but others are taking it. Some out of greed, some out of necessity due to the scarcity model which is unworkable in a international digital environment, and some just out of disgust for big contents antics. Not much can be done about the first case but the other two are quite addressable. The real world issues here are much bigger than C-32, but I am all for the educational provisions being amended in some way as to safeguard against it just being a cost saving tool. We keep explaining to you, John, in your unending campaign of disinformation, that the purpose of copyright is not to ensure “revenue” for “creators.” In any event, you have made it clear all along that the only revenues you’re talking about will be sent to collectives, not actual creators. The classroom example you cited is clearly copyright infringement, not fair dealing, because there is no imaginable scenario in which most of a classroom could duplicate entire textbooks. It beggars imagination that a single student could legally do so under fair dealing. Remember, fair dealing only occasionally permits duplication of a complete work, though the Supremes have held that sometimes there is no alternative (as with photographs). What’s going to happens is you are not going to get your way, and deservedly so. If this accelerates the demise of Access Copyright, your faith in which is rather misplaced, many of us will do nothing but cheer. On another day, let’s discuss your dismissive claim that everyone who actually understands the ramifications of C-32 is some kind of “free”-culture advocate. I assume you really mean “communist,” but then again, you’re a big fan of collectives. You'll all see that I updated the posting to show that often educators (well-intentioned as they might be) are implicated in the unfair dealings with content in schools. The point that everyone (except Sandy) seems to be (intentionally) missing is that education's primary purpose is perhaps not to deliver materials at the lowest possible cost to itself or the student population; it is to seek truth and wisdom, and to engage with and model social and ethical structures and practices. It's sad to see some prominent educators and institutions dropping the ball on this point for the sake of miniscule cost savings and/or theoretical gamesmanship. On the other hand, it's heartening to see the Rogue Preacher challenging church practice with an appeal to ethics. "...how can Scouters teach ethical behavior related to music downloading? One way: Set a good example. When you haul around Scouts in your car, for example, only play CDs that you’ve purchased. If you play CDs that you’ve burned—even if they’re legal—your Scouts may not recognize the difference between those and the pirated CDs friends have given them. If only there was someone in this discussion with connections to the Scouts. He could be sure to take up this project for them in Canada. "Adults usually can navigate such distinctions. But adolescents can’t..."
Who is the "we" who keeps explaining things to me? Is there some club of unintended consequence deniers you belong to. I'm not surprised. And absolutely, just as soon as all your ingenious predictions come true, we'll set up a little meet 'n greet where you can explain everything else to me. "UPDATE: For the benefit of the usual deniers in my comment section, here's another story from that PGC note on educational fair dealing:"
In cases like this the teacher/course developer should be reported and reprimanded. No one sensible argues the copying of entire work and disseminating it without license or permission is justified, regardless if there is an educational fair dealing exemption or not. @John "The point that everyone (except Sandy) seems to be (intentionally) missing is that education's primary purpose is perhaps not to deliver materials at the lowest possible cost to itself or the student population; it is to seek truth and wisdom, and to engage with and model social and ethical structures and practices"
Umm, John, I think I said that very thing in my post. @Crockett "There needs to be an effort to engage rather than alienate them in regards to the value of inputting into culture and society rather than just taking it." Can I go under the good guy column with Sandy now? Sorry for the double post, please delete one. Well, Crockett, I'm sure you're a good guy, but your point places the responsibility for educating students about respecting content on the content creators themselves, when it rightly belongs with the educators. That said, and to address the latest anonymous post as well, content creators have taken on the role of both educating and even a bit of de facto policing of copyright compliance by coming together in a collective and representing their interests to educational institutions. It's kind of hard to educate, though, when professors are calling our collective a protection racket. John, I don't think people need to be so much 'educated' to respect copyright. Most people know when they are infringing a work. Respect though is something that is earned, and this is more of the point I was trying to make. This really is a dog chasing the tail problem, but the reality is there is very, very little respect for the content industry today. As I'm sure there are similar feelings of creators towards infringers. I'm not going to account blame either way. There is a problem and it needs to be fixed. Now it may not technically be the content industry's job or place to be either educator or policeman, but it is in their best interest (or at least the interest of the creators) to have a healthy marketplace. So to sum up, steps should be taken to take the animosity out of the situation as best as possible. Will this mean some concessions for the industry? Most likely, but with a better public relationship there should also be some reciprocity and benefits in return. The reality is the infringers have the upper hand just by their sheer numbers. Legal or technical measures will not, as has been evident so far, curb the problem no matter how much some wish it to. So I implore the content industry, for the sake of the creators, to take a different long term view, step back from the adversarial approach, and make a concerted effort to win back the hearts and minds of their (potential) customers. Sorry John. Guess I'm slow here. I didn't see any ball get dropped with that second example. And I don't see how Joe Clark and Anonymous can so confidently claim this is a case of copyright infringement and wrong. From your update: "Most of the plays were all in the public domain and available very inexpensively." Sorry to break it to you, but if it is in the public domain, then the author doesn't have any right to control distribution, let alone remuneration. You quote does not say what the source of the digitalisation was, but if it is in the public domain, there is a good chance that it could be a PD source. I know you'd prefer unlimited copyright, but thankfully you don't get that. You should be happy with what you got. It is already far longer than it reasonably should be, and you are paying for that through rampant disrespect for copyright witnessed on the Interweeb. P.S. I looked through this months issue of Scouting Life and didn't see your reference. Can you be more specific? I'd be happy discuss copyright with the kids if you'd like. No need to apologize. I think all the readers of this blog are quite used to your slowness in picking up on the relevant points. "Free culture as a theory has brought many wonderful ideas to the table. It has reminded us all of the rich and bountiful public domain. Creative Commons licensing has advanced the idea that copyright can permit as forcefully as it restricts. These are genuinely good things." I know, reading takes time. But sometimes, it's the best way to learn things. So, what I'm actually talking about is the very clear connection one teacher makes between old-style photocopied coursepacks of supplementary readings (there's another word you missed, which might have helped you grasp the gist of the conversation) and new-style digital coursepacks made up of the same readings loaded onto the internet, with links sent to the students. This is exactly the kind of content delivery Access Copyright is seeking to license, and the reason they are being attacked by free culturists. In the old style coursepack, of course, the copyright protected content was properly and legally licensed for use (no matter how "freely" available it might have seemed to the teacher) and creators were compensated for a per-student use. In the new style, if free culturists get their way, nothing is licensed, no creator is compensated, and the rationale is explicitly cost-savings. It's not about fair access; it's about free access. I hope that clears things up for you. Take your time with it. So, next -- show me where I have ever called for unlimited copyright. And, finally -- I guess I have to take on the responsibility of an educator and assign a research project to you. Using the Internet, do a key word search for Scouting Magazine AND music downloading. If you use a popular search engine called Google, you should get the article in question as the very first search result. "This is exactly the kind of content delivery Access Copyright is seeking to license, and the reason they are being attacked by free culturists." So true, and well they should. John you give lip service to the PD but you don't actually respect it. If the works the teacher was photocopying and putting on-line were in the PD then AC has no business 'seeking to license' it. It is this kind of over reach by AC that they are being so justly criticized for. WRT scouts, I see what you are referring to is an american publication for American Scouts. The MPAA already bought the BSA several years ago, so the bias in that article is not unexpected. Your insults are a good sign. They show how poorly you are able to support your argument. Keep it up! I thought I was talking about copyright protected content, wasn't I? "In the old style coursepack, of course, the copyright protected content was properly and legally licensed for use (no matter how "freely" available it might have seemed to the teacher) and creators were compensated for a per-student use." Oh, yeah, there it is. I guess you're wrong again. What's that? Six? Seven straight years of wrongness for you on this blog? Access Copyright never claims to license public domain works. In fact they are explicit about their repertoire and put a lot of effort (and expense) into tracking actual use. Really, the Hollywood conspiracy to take over the world has reached the Boy Scouts? Is nothing sacred? Then why in the world do you have your knickers in a knot over this second example? It was pretty clear (though not certain) that the majority (if not all) the works being made available were PD. You say AC does not and should not license the PD, yet you complain about these PD works being distributed without being licensed. John, you are not going to start making sense to anybody until you start forming some consistency in your arguments. Honestly, Darryl, why do you bother? If you absolutely can't get your head around what we're talking about, why do you keep commenting? Surely there is a conspiracy somewhere that needs exposing. In case you've confused anyone else... I'm talking about a coursepack of supplementary readings that has been digitized and made available, for free, to save students money. Lost in that digital conversion is a key licensing component that prominent free culturists are actively campaigning to destroy. Current licenses only cover photocopying. New licenses will cover digital copying and/or delivery, but Michael Geist wants Canadian education to "walk away" from the very idea of new collective licences for digital use. I'll bet the teacher in question is not even aware s/he has crossed a legal line onto unlicensed territory, and if Michael Geist has his way, s/he never will be aware. Darryl appears to be stuck on the primary readings, so let's just leave him there. Seriously, Darryl, no response required. "another story from that PGC note on educational fair dealing"
And you were arguing somehow that both blatant copyright infringement and making public domain documents available on the internet was an example of all that is wrong with it. Silly me, Rather you were talking about Access Copyright's proposal for inflated licensing fees for digital distribution that does not cover public domain material, yet somehow the above example of public domain material distribution illustrates how AC and its members are getting the shaft. Of course. Why couldn't I figure that out before? Frankly it doesn't matter what you're talking about or what your arguing, the poor choice of examples you offer to backup you argument says more about your tenuous position than I ever could. I can't believe it's possible for someone to misunderstand everything about this posting (and, in fact, copyright) so completely by accident. That's as generously as I can view your last comment. I'll offer you the same terms of courtesy I've previously given to Mr. Clark -- say something relevant, on topic and factually correct, or just don't bother commenting. I'm not interested in uninformed blather. Yet you continue to respond, and say nothing at all. Both at the same time. OK, putting aside these particular examples you present, and how applicable they are to either the education fair dealing exemption, or Access Copyright's business plans, here is another relevant and topical example for you to consider. Your reasoned opinion on the moral and legal copyright issues would be greatly appreciated. Honestly. I have recently taken to listening to CBC podcasts of some of their great radio shows such as "Art of Persuasion", "Ideas", "Irrelivent Show", "Vinyl Cafe" and several others. It is great because all the shows are only a button click away on my cell phone and available on demand after the morning of broadcast. One of the ones I want to listen to is their new drama "Backbencher" unfortunately for what ever reason they have chosen not to make this one available by podcast and their chosen time slot is inconvenient for me. Instead I wrote a small Bash script so my computer could record Radio One over the Internet during the timeslot, convert it to an MP3, then send it to my cell phone. It is then almost as convienient for me as the CBC podcasts. There are several questions that arise from this. Obviously CBC does not intend for this show to be available on demand, so is there anything ethically or legally wrong with what I am doing? Is recording the radio as I am doing any different than recording live television with your VCR? I am genuinely interested and would appreciate your perspective on this. Many people like to draw lines with copyright and claim to know what is right and what is wrong. I see this as an example of the huge grey landscape that copyright occupies. Do you see any grey here or is it all black and white to you? Neither on topic, nor relevant, nor factually correct. That's the trifecta. You should write your question as a blog posting on your blog. That way, I can respond in your comments section with a question about what is better on toast -- nutella or peanut butter? To correct Darryl's latest mistake -- CBC's radio drama "Backbencher", written by playwright and former NDP MP Wendy Lill is available as a podcast. The reason Darryl does not access it that way is that it is not a free podcast. Anyone can get the entire first season of Backbencher on iTunes for $12. That's a full 220 minutes of original Canadian radio drama for $12. That's 5 cents a minute or just over $3 an hour. Each new episode of the drama is available on iTunes after broadcast. I would have to either acquire a Windows machine or find some way to get their Windows software to work under Linux. Then I'd have to convert each of these episodes to mp3 so that they are compatible with my Palm Pre (if they are not DRM'd), then upload them manually. But that is all irrelevant. You can purchase television shows online too, but that does not make it wrong to record them when they are broadcast as well. Or does it??? It would appear you have a rather black and white view on my example. Not surprising. And it would appear you have a bit of a double standard with regard to television vs. radio broadcasts. "You should write your question as a blog posting on your blog. That way, I can respond in your comments section with a question about what is better on toast -- nutella or peanut butter?" I look forward to hearing your deep insight on peanut butter. Crunchy or smooth?